One installer offers his thoughts on why, and what works. Improving air quality and reducing stress are two things that more businesses and homeowners want from their working and living environments. Plant walls can answer both of those calls, and are becoming more common in the built environment. For example, a syndicated article posted this week reports on plant walls that were installed in Goodyear’s headquarters in Akron, Ohio. Another reports on a tech startup in Minneapolis, When I Work, whose lobby features a plant wall and big windows. Inhabitat’s website includes recent stories on “plant paintings,” indoor moss walls, and a “nature filled” office in The Netherlands. There’s also a raft of do-it-yourself living wall systems available at home-improvement stores and online. 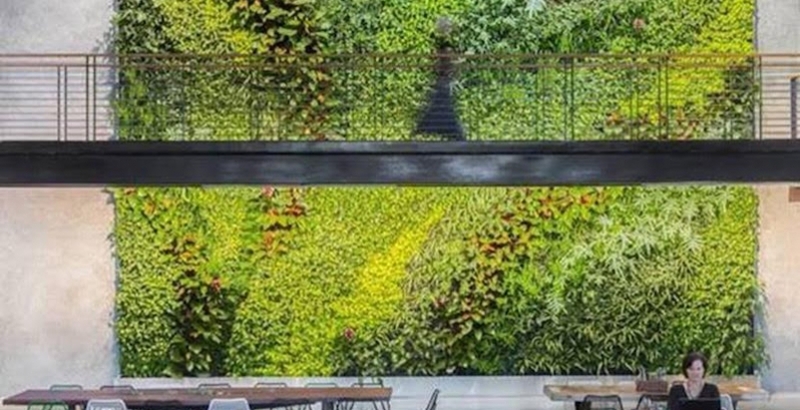 Plant walls are so pervasive, in fact, “they are almost passé,” quips David Brenner, the 32-year-old founding principal and lead designer for San Francisco-based company Habitat Horticulture, which has been enlivening interior spaces with plant walls since 2010. This year, Habitat Horticulture is on track to install 35 commercial plant walls and 15 residential walls, both numbers slightly up from 2016. The benefits of plant walls are numerous: they provide cooling through a combination of shading, evapotranspiration (the water in a plant’s roots that evaporates through its leaves), and surface reflectivity. They bring nature into environmentally hostile urban areas, and serve as interior air filtration systems. They absorb sound. And the presence of plant walls has been shown to enhance worker productivity. Brenner, who while attending California Polytechnic University studied horticultural science and psychology, accepts the research that finds a cause-and-effect relationship between plant walls and stress relief. He also believes that plant walls can be “restorative” to people exposed to them on a regular basis. Brenner’s first exposure to plant walls was during an apprenticeship at the Royal Botanic Gardens in London. He started experimenting with “going vertically” with plants in 2007 when one of his college professors gave him access to a 30- by 20-foot greenhouse on campus. Herbaceous perennial species, on the other hand, are not ideal, he continues, because they tend to lose their leaves in in winter. Brenner also stays away from plants that get “woody or stemmy” over time for his backdrops, as they tend to come off the wall. These are better used as accent plants for dimension, but not as the wall base. Like any garden, the success or failure of a plant wall usually comes down to designing for performance within a specific micro climate, and the integrity of the wall’s irrigation system. And if a client wants a low-maintenance wall, that will limit which plants can used. More important is the integrity of a wall’s irrigation system. Habitat Horticulture is a full-service provider. It prepares detailed shop drawings that integrate the plant wall into the site’s architectural plans, and outline his company’s scope of work. His firm helps clients select the plant palette and composition (depending on the installation, panels are pregrown off-site or are planted on-site), builds the framework for the wall, commissions the controls for irrigation/fertigation and lighting, and installs and waterproofs the wall system and irrigation/circulation systems. The only thing its associates and subs don’t handle is electrical and plumbing. Plant walls aren’t that heavy; about 8 pounds per sf planted and irrigated. They can cost anywhere from $100 to $175 per sf, depending on the complexity of the system. That cost typically includes water recapture, and measuring pH levels, labor, and structural requirements. 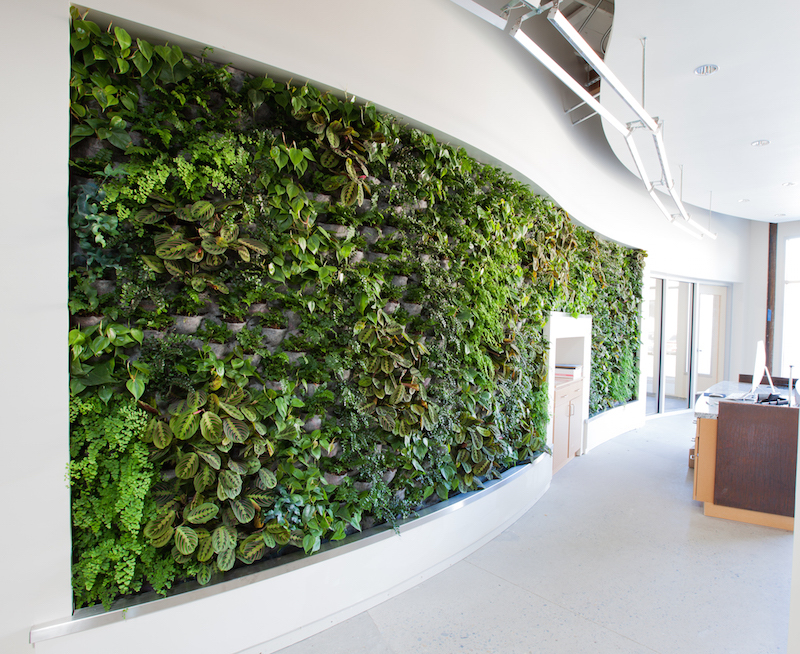 Clients sometimes turn to living walls as part of their strategy for their buildings to earn green certifications. For example, one of Brenner’s clients, the architectural design firm Architectural Nexus, renovated its new office in Sacramento to meet standards of the the Living Building Challenge Certification. A critical component of that building’s water filtration function is its living wall, which is irrigated by greywater repurposed from showers and sinks on-site. The wall can be viewed from all desk spaces throughout the office and from the street. The San Francisco Museum of Modern Art also uses a plant wall Habitat installed to recycle water from its stormwater retention tank. Four years ago, Habitat Horticulture installed three large plant wall and a living wine bar (live plants beneath a glass bar top) into DPR Construction’s office, which was the first certified net-zero energy building in San Francisco. Clover Payments, a payments software startup whose office is in a net-zero energy building that formerly was a racquetball facility, boasts a 30-ft-wide by 22-ft-high living wall that Habitat Horticulture installed in 2015, which helps provide cleaner air circulation for tenants. More recently, Habitat Horticulture put in a plant wall at the main entrance of Westfield UTC, an open-air shopping mall in San Diego that is undergoing a $600 million renovation and expansion that will add 90 stories and 215,000 sf of retail space. Healthcare could be Habitat Horticulture’s next frontier. Its portfolio includes a women’s health center. And Brenner says that some hospitals have “reached out” about adding a plant wall to their facilities. “Their biggest concern is infection control,” which he says can be managed by filters, testing and—to be on the safe side—injecting chlorine into the system.